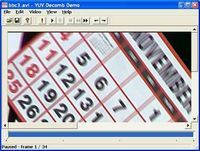 DVD Demuxer is designed for decompilation of total DVD on all data streams by pushing the only button. DVD Demuxer generates text file with detail description of every data file extracted from DVD. This file contains text information in Sonic Scenarist script format. This file does not contain information about disk structure (Track Editor and Scenario Editor) and can not be used as full script file. This file can be used only for information purposes. DVD Demuxer is ideal match in case of total decompilation or extraction of any data from DVD. Output files of DVD Demuxer are well structured and named, so you have visual information about disposition data in source DVD. Later you can use these files separately in any of DVD authoring program.